When you think of Lacoste, what comes to mind? If you think tennis, crocodiles and the Hamptons, then you're not alone. That's just what I was thinking as I walked into the Lacoste boutique in downtown Vancouver a couple weeks ago. Why was I there? I was being asked to stretch my style boundaries as I was chosen to participate in the Lacoste challenge as hosted by the Vancouver Beauty & Lifestyle Bloggers network. My task? To take Lacoste's new Matchpoint collection and make it my own. For their SS 2014 collection, entitled the Matchpoint & Maritime collection, Lacoste put their cultured finger on the pulse of fashion's obsession with sportswear. Merging sporty classics with urban style, the resulting pieces are vibrant, body-conscious and dare I say, a little edgy? Whatever your style, there's a little something for everyone in this collection, from Lacoste's classic polos and tennis skirts, to loose cotton pants and office-ready silk blouses. My style is a mix of downtown chic crossed with hipster-granny, so I was intrigued by the thought of taking a classic Lacoste piece and mixing it up in a trendier way. Surprisingly, the answers to my entire outfit were from Lacoste itself thanks to a beautiful jacquard sweater. 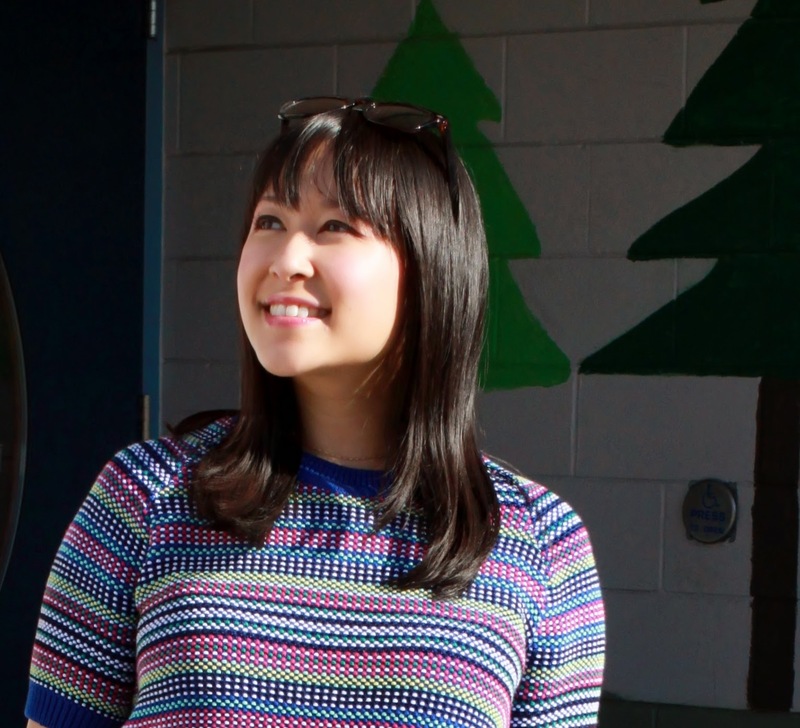 My eyes were immediately drawn to this sweater as its bright rainbow of colors and loose fit totally epitomized my style. I decided to pair it with a crisp white tennis skirt as a nod to Lacoste's roots. Paired with my favourite English Laundry sunnies, a delicate gold chain necklace and some cute Aldo flats, I was ready for dancing among the flowers. Thank you to Lacoste and the challenge organizers for choosing me to participate. I had a fabulous time choosing this outfit and gaining a new appreciation for the brand. If you like the outfit I chose, I would really really appreciate if you could vote for my look as your favourite in the Lacoste Challenge! To send your vote, simply go to the Maddy Loves Facebook page and give your “like” or comment on my outfit. By voting, you'll also be entered to win a special Lacoste prize! A huge thanks and virtual hug for voting for me!